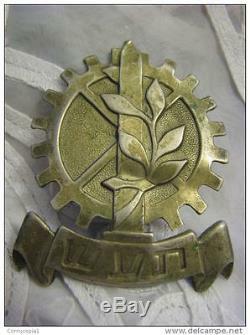 TA'AS Military Industry large Hat Badge. Ta'as, an abbreviation of the Hebrew for "Military Industry" (Hebrew: Ta'asiya Tzvait), was the clandestine arms industry of the Jewish settlement in Mandate Palestine. In the 1930s it was headed by Yisrael Amir. Ta'as was based on a number of small workshops and factories, the first one being hidden in a tannery ("The Aleph Institute") on the north beach of Tel Aviv. "Aleph" had a professional staff of lathe operators, metalworkers, plane operators, milling machine operators and others. Eliahu Sacharov, one of the heads of the organisation, was responsible for testing the first weapons produced by Ta'as at the Solel Boneh quarry at Migdal Tzedek. Haim Slavin, an engineer from Russia who worked with Pinhas Rutenberg on building a power station at Naharayim, was the general manager from 1937 to 1952. Under Slavin's leadership Ta'as was reorganised and thereafter reached new heights of production such that it became the primary supplier of weapons to the Haganah. Slavin also developed new plants for Ta'as. During the Arab Revolt Ta'as developed an 81-mm mortar, the Haganah's heaviest weapon at that time, and manufactured mines and grenades, 17,500 of the latter being produced for use during the revolt. The Haganah decided to develop mortars locally in 1934, beginning with a copy of the British 2-inch mortar. This task was given to David Leibowitz, one of the founders of Ta'as, who was later to win fame as the developer of the Davidka mortar that was used extensively in the 1948 Arab-Israeli War. Size: 60 x 51 mm. The item "TA'AS Military Industry Haganah IDF Hat Badge Palestine Eretz-Israel 1940 RARE" is in sale since Thursday, February 5, 2015. This item is in the category "Collectibles\Historical Memorabilia\Other Historical Memorabilia". The seller is "1onegoodmoment" and is located in A beautiful country. This item can be shipped worldwide.